The music notation scenario improved this week, as Xenon Labs resurrected Symphony Pro with a new interface. 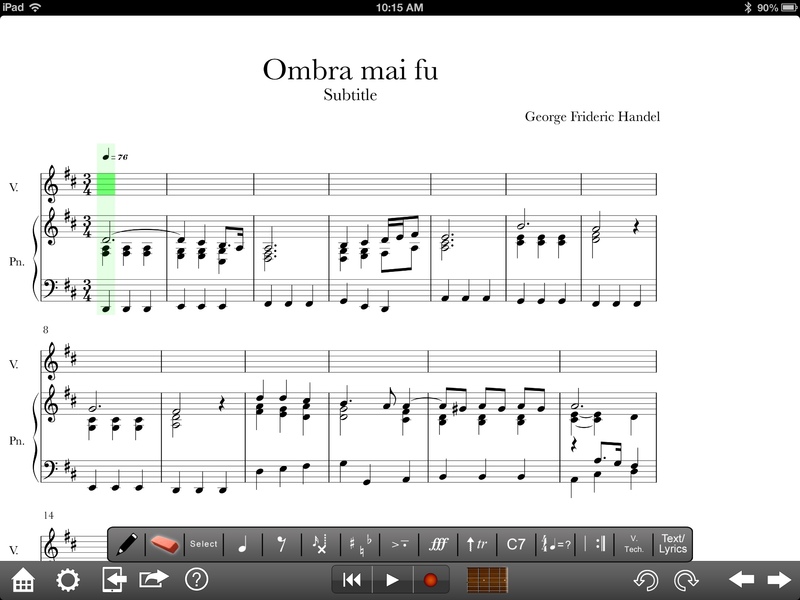 Symphony Pro was the first serious music notation app on the iPad, coming out in late 2010, just a few short months after the release of the iPad. 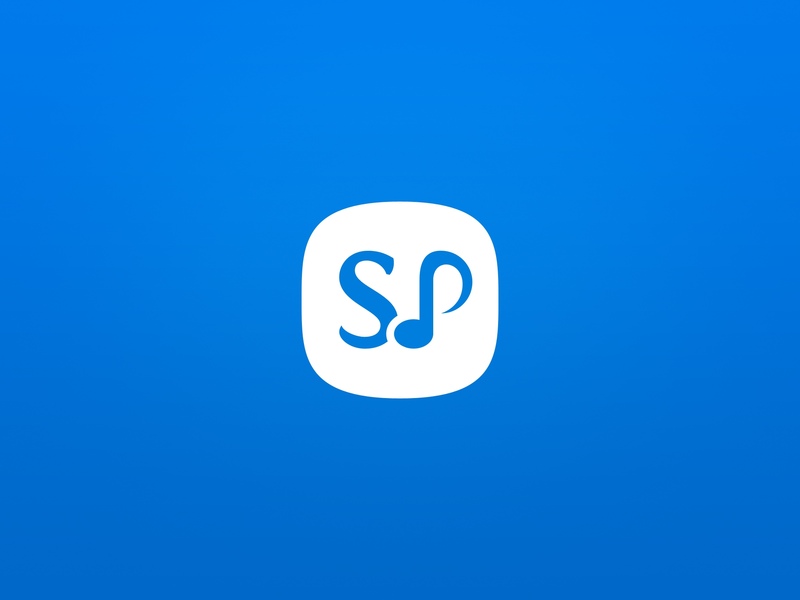 The first version of Symphony Pro was amazingly solid (I released a video about that app, which has over 30,000 views), but subsequent versions added more functionality and more bugs. Then, without any notice, Xenon Labs ceased development of Symphony Pro and pulled it from the App Store. I was able to contact one of the original developers of Symphony Pro and he confirmed that it was no longer in development. But it's back–same company, same developers. Symphony Pro 3.0 offers an improved interface, featuring tabs that hide on the left side of the screen. The left-side interface works well, although I could see issues arising if you are left-handed. I prefer the toolbar on the left and the keyboard on the bottom of the screen, so you can use both hands while entering music. I find this layout preferable to the layout of Notion (another notation app on the iPad) where the toolbar rests on top of the keyboard. I have had some issues while using some of these tabs, such as the “dot” for a dotted note. By expanding the “dot” tab, you can choose a single, double, or triple dot for a note. The problem is that it isn't easy to turn off the dot…it requires two entires into the hidden dot tab to do so. 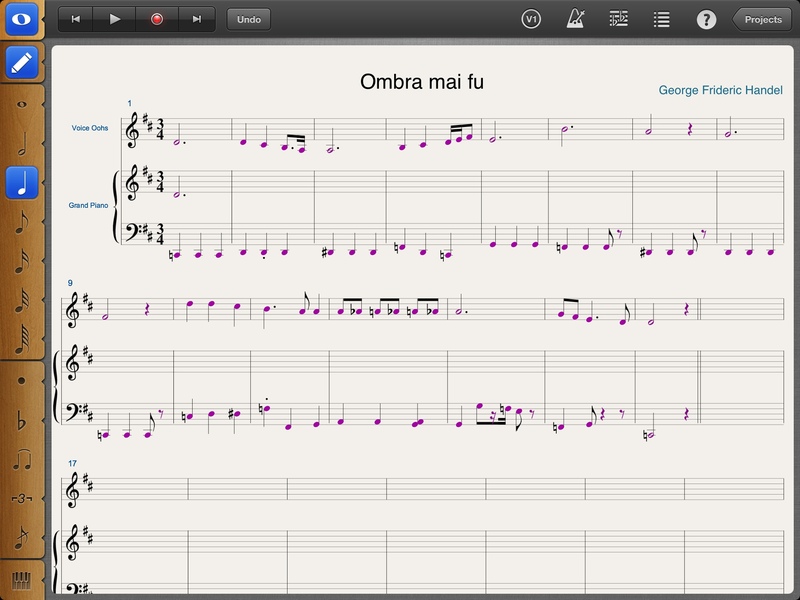 It can also be annoying to switch between notes and rests using the hidden toolbars. There is something to be said for having all options (notes & rests) available at all times. I have also had difficulty selecting notes to cut and paste from staff to staff–I have been unable to increase the size of the selected area (there are no handles that I can see to use in Symphony Pro 3.0). 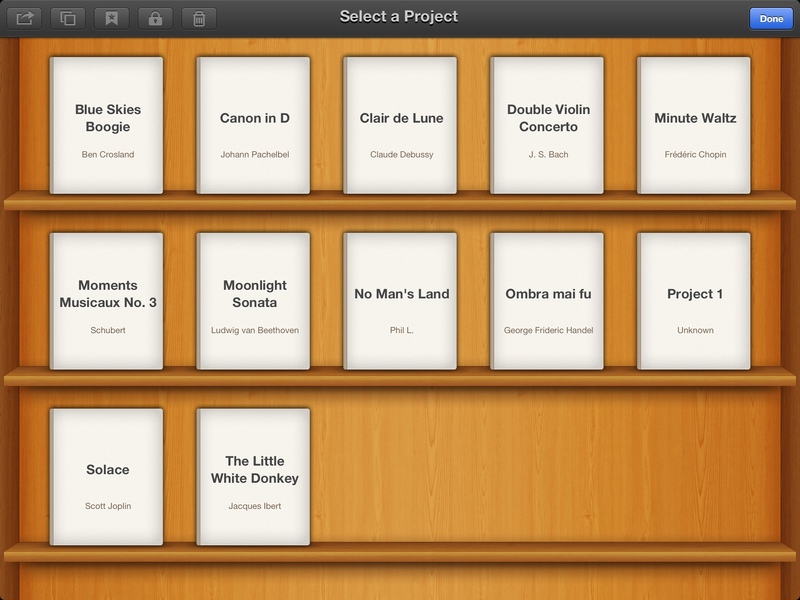 Whereas the old version of Symphony Pro had export features on the notation screen, the new version of Symphony Pro uses a bookshelf (think iBooks) to organize and export documents. The use of the bookshelf makes Symphony Pro feel very much like a “stock” iOS app, but I am concerned about what will happen with iOS 7…I would think that as Apple leaves skeuomorphic design (making apps look like physical objects, such as felt, wood, leather) they will change the look of the bookshelf, too. Xenon Labs has been using Facebook as a key way to discuss its new version of Symphony Pro, and early reports indicate that bugs continue to affect the app. Some users seem to be having issues with the PDF export. Personally, I am having continued issues with MusicXML import and export. My blogging colleague, Paul Shimmons, has reported issues with MIDI input (and I have verified this using Symphony Pro and my Akai LPK25). At the same time, Notion for iPad is available–currently for $14.99 (additional instruments are available as add on purchases)–with a cost of 1.7 GB of space on your iPad. As previously mentioned, the only “negative” about Notion is that the toolbars exist above the piano keyboard, and that notes and rests are also in separate toolbars (like Symphony Pro). But Notion is much more “mature” than Symphony Pro, with a huge update coming in the next two weeks. I did my usual “test” of notation software, trying to enter the same score in both programs. I had a great deal of difficulty working in Symphony Pro, but was quite productive in Notion, particuarly when I started using my Akai LPK 25 USB keyboard to enter notes. As a matter of recommendation, if you are limited to only buying one app, you should choose Notion; if you can afford Symphony Pro while it is on sale, you should buy both. One thing is for certain: you can do productive work in music notation on your iPad, and doing so is only getting easier as these apps add more features (and work out more bugs).